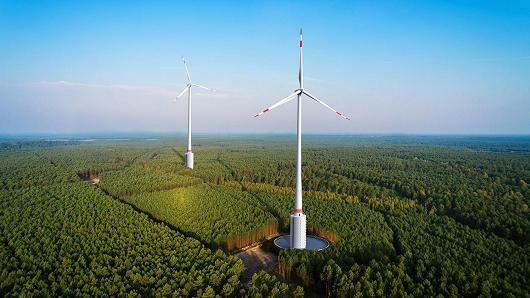 In Germany, two renewable energy sources are being combined in a novel project looking to break new ground and transform the scenery of a German forest. The scale of the project GE is involved in, which is based in the Swabian-Franconian Forest in Germany, is considerable. The wind turbine towers used in the project will have a “total tip height” of 246.5 meters, with each tower’s base and surrounding area used as a water reservoir. “We’ve got a series of wind turbines, that are kind of… conventional, except that in the base of them we’ve got a storage reservoir that actually surrounds the base of the wind turbines,” Cliff Harris, who manages GE Renewable Energy’s onshore wind portfolio in EMEA, told CNBC in a phone interview. In addition, a valley nearby – around 200 metres below the turbines – will be home to a lake and a pump/generator hydro plant with a capacity of 16 megawatts. “When the wind blows, we generate electricity from the wind turbines,” Harris said. “When the demand for electricity is high you can release water from the reservoirs that are held around the base of the turbines down the hill, through the turbines and into the reservoir,” he added. Construction of the project is underway, Harris added. GE has said that the four turbines are anticipated to be commissioned by the end of the year, with the “full” power plant expected to be in operation by the end of 2018.